Big, muscular shoulders have been for centuries the mark of manhood as well as an indication of possessing strength and power. Having well developed shoulders can mean the difference between a wide and impressive physique or a narrow and poorly developed one. With their variable angles the shoulders can be seen from any side (front, side and back) and cannot be hidden, even beneath your clothes, but when developed fully stand out beautifully on top of the arms. Thus you should strive to build your shoulders to their maximum size and shape from all sides (especially the side and rear – the reasons for that will be given later on in the course) to add maximum impressiveness to your physique. Having well developed shoulders is important not just because of how good they make you look but also because of the fantastic support they give you when you train other upper bodyparts. You might say that the shoulders are the key to developing all other upper bodyparts. They permit the handling of heavier weights in various exercises which is important to building a massive and shapely body much faster. For example, you can be stronger in all chest and tricep exercises simply because you mainly press to exercise both bodyparts. In my approach towards building a complete, perfect, physique, I always paid plenty of attention to my shoulders, and I am noticeably strong on all shoulder movements due to the fact of having been a successful junior Olympic lifter in Egypt, where I won some titles lifting (and all this took place when I was still a bodybuilder, not the opposite as is usually the case). 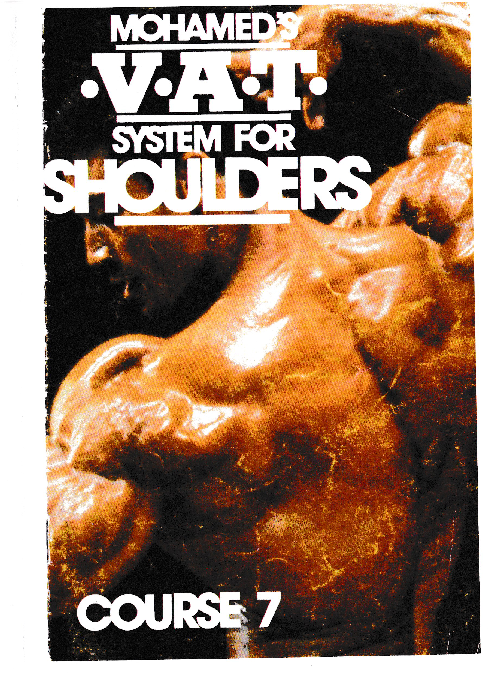 Those old weightlifting exercises and workouts left their good blessings on my physique permanently in the way of thick, well-developed shoulders and built the foundation on which I further built and refined my shoulder development with the V.A.T. exercises you’ll find in this course.